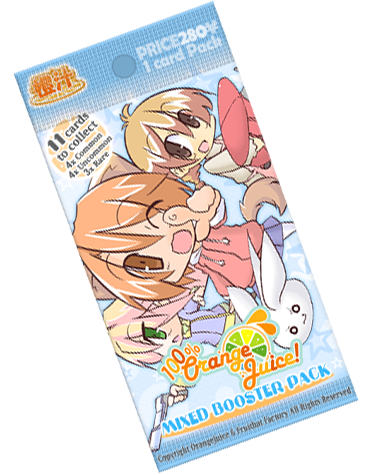 March 9, 2015– Independent game publisher Fruitbat Factory is proud to announce the release of a new card expansion DLC for 100% Orange Juice on Steam. The new Booster Pack adds 11 new game cards designed for advanced players. The pack comes together with the release of game version 1.9, which adds several other new features. 100% Orange Juice is a digital multiplayer board game populated by developer Orange_Juice’s all-star cast. Characters from Suguri series, QP Shooting series, Flying Red Barrel and Sora come together with all-new characters to duke it out… with dice. “This is something we’ve been asked for since releasing 100% Orange Juice on Steam. It’s the biggest single content update we’ve made since release. The 11 new cards will allow for countless new ways to impress and frustrate your friends.” says Jakke Elonen, Project Lead. Mixed Booster Pack includes 11 new game cards (3 rare, 4 uncommon, 4 common) designed by Junpyon and Hono of Orange_Juice. The cards of the set can be purchased from the in-game shop and used in both single and multiplayer. As usual, all cards in a multiplayer game can be used by all players via the center deck, even if they do not own the DLC. Other version 1.9 features include 3 new Maps – Night Flight, Clover, and Farm, 1 new Panel type, 2 new Field Events and other additional improvements for players to enjoy. 100% Orange Juice – Mixed Booster Pack comes priced at $1.99, with a -25% launch discount for the first week. 100% Orange Juice and the two previous character packs can also be purchased at -50% for a week. “With this update we’re adding a ton of new elements to spice up 100% Orange Juice’s already zany gameplay. Alongside the cards, the new fields and events should bring new twists for even the most experienced fans. Working on the additions has been very rewarding and I can’t wait to see the community trying them out. ” adds Tony Blomqvist, Lead Programmer. Orange_Juice is an independent Japanese game circle known for their quirky shoot ’em ups. Developer of the popular online boardgame, 100% Orange Juice. ← 99 Spirits – Weeping Demon’s Bell Now on Steam!